Ethers are generally effective solvents for organic molecules because __________. Ethers are used as solvents in many organic reactions because they are relatively non-polar. Additionally, they don not participate in hydrogen bonding, are inert to most organic reagents, and have low boiling points. This makes ethers effective solvents that will not interfere with the reagents, products, or anything else in the reaction. Working with ether solvents, however, can be incredibly dangerous as they are usually highly flammable and can be explosive. A student has just finished running a reaction for organic chemistry lab. The reaction has produced a primary amine, as well as multiple dialkyl ether byproducts. The student has 1N aqueous HCl, 1N aqueous NaOH, water, and ethyl acetate at his disposal for purification. After diluting the crude reaction mixture with ethyl acetate, which of the following extraction methods will successfully isolate the amine product? 1) Extract the organic phase with 1N aqueous NaOH. 2) Discard the organic phase. 3) Neutralize the aqueous extractions with 1N aqueous HCl. 4) Extract the neutralized aqueous phase with ethyl acetate. 1) Extract the crude mixture with 1N aqueous HCl. 3) Neutralize the aqueous extracts with 1N aqueous NaOH. 1) Wash the crude mixture with water. 3) Neutralize the aqueous washings with ethyl acetate. 3) Extract the aqueous phase with ethyl acetate. 1) Extract the crude mixture with 1N aqueous NaOH. 3) Neutralize the aqueous extracts with 1N aqueous HCl. To isolate the amine, it is first necessary to treat it with acid to form an ammonium salt. This would go into the aqueous phase along with the HCl, while the dialkyl ether byproducts would remain behind in the organic phase of the crude mixture. After discarding the organic phase, treating the aqueous phase with 1N NaOH would convert the ammonium salt back to the free amine, which could then be extracted with ethyl acetate. As for the other answers, extracting the organic phase with aqueous NaOH would leave the amine behind in the organic phase, as would washing with water. Also, the protonated amine would have to be neutralized in the aqueous phase with NaOH in order for it to be extracted back into ethyl acetate. A first-year graduate student treats compound A (below) with aqueous sodium hydroxide and heats the reaction for one hour. After cooling down the reaction, what must he do to isolate the desired carboxylic acid product? During the reaction, the ester is converted to a carboxylic acid, however, because of the basic conditions the acid would be deprotonated to form a carboxylate salt. This salt would be soluble in the aqueous phase, and would have to be protonated by adding dilute acid to convert it into a neutral molecule. We want to isolate the carboxylic acid product via extraction, forcing it from the aqueous phase to the organic phase. Only when the product is neutral can it be extracted by organic ethyl acetate. Simply concentrating the reaction mixture, either by itself or after neutralizing any base with acid, would be insufficient because residual inorganic salts would remain with the desired carboxylic acid. Likewise, extracting the reaction with ethyl acetate without adding any acid would not extract the product, as it would remain in the aqueous phase as a carboxylate salt. When would it be appropriate to use extraction in order to separate compounds in a solution? When the compounds have differing conjugated double bond lengths, but similar molecular weights. When the compounds have similar molecular weights, but differing polarities. When the compounds have similar polarities, but differing solubilities. When the compounds have differing molecular weights, but similar solubilities. Extraction is a useful separation technique when there is a mixture of compounds in a solution that have similar polarities, but different solubilities. The three-step process of extraction can take advantage of different solubilities by introducing the mixture to different acidic and basic conditions. Shown above is the chemical structure for penicillin. 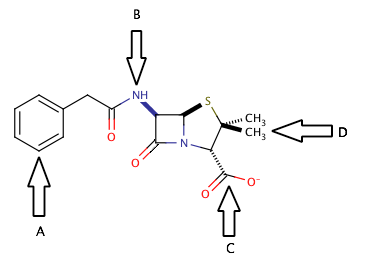 Which of the arrows points to a functional group that could be used to extract penicillin into the aqueous layer during liquid-liquid extraction? The correct answer is arrow C. Separation into the aqueous layer during liquid-liquid extraction is most easily accomplished by creating a salt somewhere in the molecule. There are two common targets for creating salts in organic molecules. The first target is to create a carboxylate salt, by the addition of an inorganic base (such as NaOH) to a carboxylic acid or an existing carboxylate group, as shown in the diagram at arrow C.
Another common target for forming a salt would be to protonate the nitrogens of the molecule. Addition of an inorganic acid (such as HCl) would be a good way to protonate the nitrogens and also provide a negatively charged ion that would form the salt. In this case, however, the nitrogen at arrow B is involved in an amide functional group, and cannot be protonated. For the nitrogen to be useful in extraction, it must be part of an amine group. The main point to take away from here is that during liquid-liquid extraction, the goal is to separate compounds into aqueous and organic layers and isolate the desired product alone in one of these layers. Ions and salts will generally be extracted into the aqueous layer, where nonpolar large structures will generally be extracted into the organic layer. Look for areas on the molecule that are susceptible to acid/base reactions, and you will find a good target for creating an ion for liquid-liquid extraction. Extraction is the process of removing compounds from a solution by taking advantage of varying solubilities. The process of extraction for a mixture of diethylamine, phenol, acetic acid, and ammonia involves three steps. 1. Add a strong acid and shake the solution. Let the aqueous layer drain off. 2. Add a weak base and shake the solution. Let the aqueous layer drain off. 3. Add a strong base and shake the solution. Let the aqueous layer drain off. Which of the following compounds would be the last to enter the aqueous phase using this technique? Think about what will be reacting with each substance as it is introduced to the solution. First, a strong acid is added. This will make all bases in the solution (ammonia and diethylamine) become protonated, allowing them to become soluble. They will transition to the aqueous phase and be removed. Next, a weak base is added. Only carboxylic acids will be deprotonated by this addition, gaining a charge and transitioning to the aqueous phase. Acetic acid will be extracted. Finally, a strong base will deprotonate the weak acids, such as phenol. As a result, phenol will be the last molecule to leave the solution. You want to separate a compound with a boiling point of 130oC from another compound with a boiling point of 134oC. The two compounds have similar sizes and polarities. Which separation technique would be the most effective? When two compounds have very similar boiling points and no other major differences, the best technique to use is fractional distillation. Simple distillation is only effective when the boiling point difference is large (20oC or more). Vacuum distillation is mainly used when the compounds have much higher boiling points, as the vacuum reduces the vapor pressure and allows evaporation to take place at lower temperatures. Thin-layer and ion-exchange chromatography would more likely be used with compounds that had polarity or charge differences. Synthetic testosterone is typically synthesized in yams and then used by athletes to boost their physical performance across various sports. This practice has been deemed illegal by most major sports authorities. Testing for synthetic testosterone use is accomplished by comparing the chemical composition of synthetic testosterone to natural testosterone. Yams contain a higher C14 to C13 isotope ratio than the ratio found in human beings. How would this information help in distinguishing between natural and synthetic testosterone, in the event that an athlete claimed that the synthetic testosterone in their body was a false positive result due to the fact that they ate many yams? The C14 to C13 ratio difference would cause the different forms of testosterone to have different absorption spectra, thus giving each testosterone its own unique set of mass spectroscopy results. Naturally-made testosterone would have a higher ratio of C14 incorporation into its molecular structure, which would be detected by mass spectrometry and set it apart from testosterone produced in yams. This would not be helpful in determining whether or not the athlete used synthetic testosterone. Testosterone synthesized in yams would have more C14 incorporated into its molecular structure, which would be detected by mass spectrometry and set it apart from testosterone produced in humans. Because yams have a higher amount of the C14 isotope, they will be more likely to incorporate it into the testosterone they produce. Humans, however, have very low levels of C14 in their bodies, so even if they ate many yams, the testosterone produced would still have more C13 in it than C14. Which of the following isomers would not be able to be separated via distillation? Distillation is the separation of compounds based on differing vapor pressures. Compounds with different boiling points can be separated from a solution when distilled. Enantiomers have the same physical properties, which means their boiling points are equal. 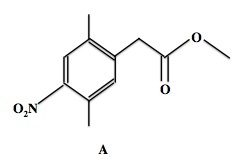 This means that these compounds would be unable to be separated by distillation. The other types of isomers listed differ in physical properties, and could be separated by boiling point. You have a solution of racemic enantiomers, both of which exist in the liquid state. Which type of distillation method would work in separating these two liquids? Distillation separates compounds based upon their difference in boiling point. Enantiomers share physical properties, and will thus have equal boiling points. Separating enantiomers by distillation is not possible. Although fractional distillation will help separate liquids with similar boiling points, there is no available distillation method that can separate two liquids with identical boiling points. Another method of separation would be needed. Separating enantiomers can be particularly difficult, and generally requires temporary conversion of one compounds to a diastereomer or the use of chiral chromatography.